Where are we today? Look at this place we live in, intoxicated with hate and division. So many different people trying to force so many different ideas, it will just not hold ground. That apocalypse I have been fearing since I was a kid has truly come to be, with recent huge changes in the ratio of global power enforced by the let’s leave Europe vote of the UK and the inauguration of president Donald Trump has reinforced my beliefs (ten fold) that we are heading for Armageddon. As a teenager I questioned why decisions that were made by politicians for the seemingly good of society were clearly fatally flawed, now I get it. You need to join the club, you have to answer to God, the Bible. I have been barraged by all my peers all my life that the Bible is nonsense, a story made up to contain order among men. But with little study I see that it goes deep, very deep. My father who I am sure would not mind me saying is an atheist put something in my mind, why do so many highly intelligent and accomplished people, and people in positions of power adhere to this ideology? Because it is an ideology of survival, what ever has been planned for our demise the one escape may be God. ‘In the eye of man’ God is man, all who have questioned the word of God question themselves, the destruction of society as we know it has been formulated by us. For the good of man, join ranks with those who are on a mission to save us just to be part of a group, righteous and forgiving to try and survive these end days. I get mildly irritated by the constant bombardment of memes and the like professing that my life is nothing but a prison and that the only meaning of my life is subservience to the system. Yes we pay rent and taxes and buy food and clothing but what I do to earn the money to pay for these things is far simpler and enjoyable (to a limit) for me than having to farm land, make clothes, build houses and establish law and order & national security, oh don’t forget free health care. Although I agree there is a huge and unfair disparity in income between the classes and there are unfair financial rewards/gains associated with certain sectors of the economy, I could not possibly from this point see another way without massively disruptive changes. I am trying to keep my views simple, for example if I want to buy some new clothes for my daughters I will go and help some people who have problems that I can help them with, they will pay me and I will go to a shop and use that income to pay for the clothes I couldn’t possibly make myself, of course I could by some eggs and bacon for tomorrow’s breakfast with the change as I don’t own chickens or have an abattoir in my shed let alone pigs roaming my back yard. 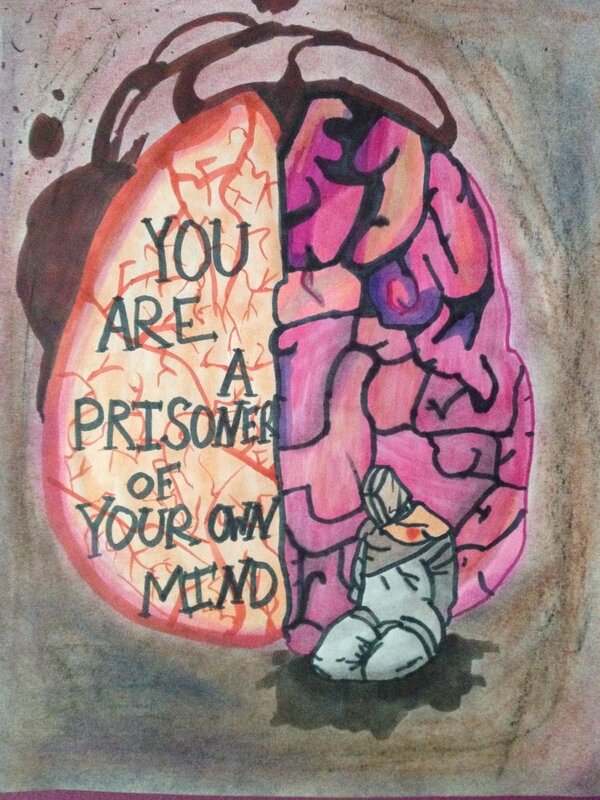 So stop telling me that I am a prisoner. Roaming the forests hunting for food and trying to gain winter warmth in makeshift shelters may seem intrinsic in our evolutionary psyche and occasionally desirable, but it didn’t yield good health, happiness or longevity. I am happier living more comfortably and paying for my means via a system of government, albeit imperfect it is all we have, I also tend to find the misdoings of those in power are greatly exaggerated by the media. We should all be working together to iron out the great divisions and nurture our society rather than providing the time and effort toward an alternative illusion that can do nothing but harm us. There is a birthday today of a friend of mine, we were once very close and it was a wonderful and very natural partnership, things arise though with life stuff and the obvious divergence of ideals over the years hindered communication. I have figured that a lot of the issues with my relationships with friends has been my inability to connect, I cannot just be natural and now I see why many of my friendships failed. I know how to be friendly to people which is the problem, I have sat quietly all my life mostly in the background and analysed how people interact in different situations and what the possible reactions & outcomes and could be, that is how I know how to be friendly but it isn’t natural to me. Now I understand that people just have this superposition where it is totally natural for them to react to others’ (questions, emotions, statements and general rhetoric) in a plausible, accepting and socially edifying way. Me? I always say the wrong thing, put my foot in my mouth or just create an uncomfortable situation in my group, because I struggle in social situations. What helped my ability to mingle was drink, so I drank in all social situations and when I drank I got more detached from peoples’ emotions and more wrongly outspoken. I am ashamed about this and I have spoken to professionals to help me one day resurrect that feeling of friendship I once had with my favourite people. Only because I miss having friends. My daughter Sophie has been diagnosed with Asperger’s Syndrome and she is ‘EXACTLY’ like I was, the more I learn about her condition and the more I research Aspergers and the more I speak to the professionals looking after Sophie the more I understand my own state. Even consultants dealing with my PKU that is totally unrelated to Aspergers have indicated that PKU people somehow show these traits. So to wrap it up I can only apologise to my old mates if I was too much to handle, especially on the ‘say what you think’ front, I am the last in the world who would want to upset people, I cope by being the guy in the group sitting back trying to understand rather than acting on impulse but occasionally my actions precede my thought. Happy birthday to my best mate Cam. Ok I am making another comment the day after the one before…How bizarre! Ummm, wahey visited the Observatory Science Center with the bambinos, had a pub lunch, home. Car wash and then a roast…simples. Work is on a knife edge at the moment as I have been blamed for not reporting in on Wednesday because of my gammy knee, I am certain I made it quite clear I was not at work and after my visit to the GP I am also being put on a course of steroid injections, oh the joys of life. On top of this I have had a stinky cold for over a week and drowning in snot, sweating like a nun in a brothel and shivering as though I have been dragged from a hole in the ice of the Antarctic. There is so much to doooo!!! Having taken holiday from work there is so much work to be done. We are moving house from number 7 X street to number 3 X street. You may think this makes things easier but it does not, marching boxes from one house to another expends a lot of energy so we are getting help in the shape of two men and a van, I dare not say a removal firm. After a few deliveries of white goods tomorrow and putting up a few curtain poles and blinds it all begins Saturday morning…Ugh! What I love is the family have rallied around and we have half a dozen hands on deck, then there is also the spectacle that will be created by numerous volunteers marching back and forth between addresses, something I was not bothered by particularly until the wife pointed it out. Am I Bothered? Hmmm no, we need to get this stuff out. We live in a close, there are seven houses, we know all of them except number five who must be devil worshipers or terrorists or something so a giant cross maybe erected in line of sight of their house during the move. They all know the situation so off we go without shame. Following along from the general theme of this blog that is, it is usually about my life so I have been told discreetly. I know not enough of little else to make a blog interesting, not that my life makes it so, quite the opposite I would presume. The problem is I don’t know who reads this anymore so I’m not sure what to say, once an inner circle of friends regularly kept up and that drove me to enlighten them on what I thought may interest them (Not egotistic whatsoever, you know who you are <3 ) and I was doing more interesting stuff it has to be said, hey I am 47 this year and I have a boring job and a disabled wife, I am not going to be able to entertain anybody with anecdotes of frivolous episodes down town on the weekend or stories of magnificence because I have climbed Kilimanjaro on my hands while playing Rule Britannia on a penny whistle. My life is dull, it always has been, it was only ever me who was excited about stuff as a kid, everybody else just thought I was weird. It took me until my 40’s to figure out I was this oddball, looking back at broken relationships and failed friendships I see it quite clearly now & why people didn’t want to spend time in my company. It has driven me to view the world from an obtuse angle that doesn’t follow the norm, what ever that is. I love the people around me so much, I consider I have a family to protect and I say that the way it sounds, as odd as I may seem to others, I trust that my reason for being is about to be revealed… and in an apocalyptic future I will find that purpose that has evaded me all my life. Getting things on track again and feeling a lot more positive, it is almost certain that my motivation and general mood take a nose dive when I do not follow my PKU diet that I am crap at, so I have to resort to other means to elevate my well-being and I feel this will have its permanence for some time to come. World affairs aside, in my bubble things are looking quite good, Ava has practically passed her dairy trial and this will open up a much expanded diet for her, I couldn’t express what this means to me. She has been elevated from ‘Bronze’ to ‘Gold’ in her grouping by her violin teacher who believes so much in her and she is really enjoying her dance classes. Sophie is loving her Ballet too and myself, the wife and the grandparents are all going to see them perform today at the Ratton Academy of Performing Arts. Joe has joined the Eastbourne Otters swimming club, it’s really good to see him enjoying something he is quite passionate about and he is doing really well, already a better swimmer than me! On the work front we are in summer hours and I have negotiated a more flexible approach for my working hours which is a great benefit to the family, I am trying to make a difference on the commercial side of things to see if one day I can shed the domestic ball and chain. Have a date to pick up a brand new van too 😉 I am registered to start a degree course towards a BSc or Beng (decision to be made after 1st year), this is more for a path towards a personal goal rather than a career decision and also a chance for me to develop my focus and attention, something I have struggled with my entire life. Along side this I have also signed up for an online MIT course in electronics as if you know me well, this is of particular interest to me and could be channeled along the career route depending on what lies ahead. Bike wise I have faltered, I had ambition to get out and train for certain off road events this year, but my motivation seems to have steered me down a more cerebral trail. There is still time to get registered, get out and get fit for the London to Eastbourne event in September which is something I really enjoyed last year, time will tell. All in all a high point 🙂 Peace All. Autism. Think about this, more and more children are diagnosed each year having autistic traits, society generally calls them weird. What if it’s a natural progression of evolution toward the idea that parents aspire to improve their child’s personal development? Thus resulting in the natural state of newborns able to follow an introvert path of self-improvement devoid of interaction with other children. Year by year the number of Autistic children increases, remember these children mostly grow up into very intelligent and useful members of society though the early years are more challenging for the parents, weeding out parents who are not worthy (natural selection). We may be on the cusp of transcendence to a higher intellect, these ‘autistic’ children could be our gateway to the future, non functioning in a society that cannot yet meet their needs but with the vision and intelligence to travel beyond the realms of common thinking and create a better society. © Copyright 2019 Lemmy. All rights reserved.